My father and I each owned one of these from 1960 for several years. I passed my driving test in my father's. Introduced in 1937 at a time when engine size was restricted by taxation and the 10 h.p. class was a highly competitive market, the "10" was designed to provide a low rated car with a large car "feel". Independent front suspension and low weight against size were two of the goals. This was the first British car with "integral" construction - no chassis. The front suspension was by enclosed torsion bars and there were very effective hydraulic brakes. The "10" was an outstanding success and really was a modern car compared to its competition. The two we had were equipped with full leather upholstery and sunshine roofs. They were very good performers capable of 75 mph and 40 mpg. I managed to write-off mine by rolling it when a front brake wheel cylinder seal leaked oil and hard braking swung the car into a ditch whereupon it flipped over and I came out through the closed roof, luckily without much damage. Dad kept his for about 5 years until I sold him the '54 Humber Hawk. 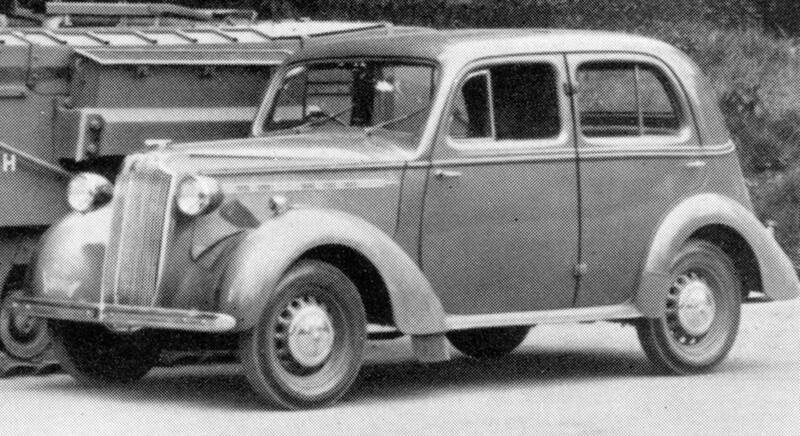 First British car with integral body/chassis. Torsion bar independent front suspension.